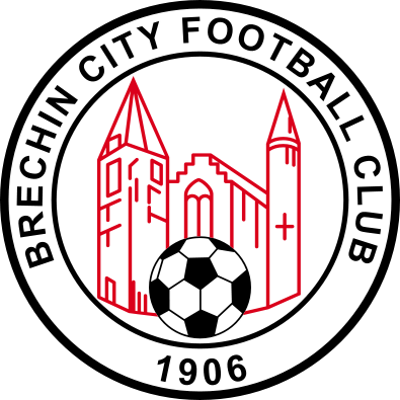 Despite Brechin City entering the new year still without a league win in the 2017/18 season, they had proved troublesome to United in the preceding two games between the teams. Despite that, the United players certainly responded in the right way to the previous Friday’s disappointing result in Paisley as they took a two-goal lead within the first six minutes of this game. The first goal came after a mere 43 seconds. Although the Brechin defence were able to cut out a long ball forward, the loose ball was picked up by Billy King. He picked out Jamie Robson who had made an overlapping run, who in turn cut the ball back to Scott McDonald on the edge of the box, who hit a low first time shot across away goalkeeper Graeme Smith and into the net for his third goal in three games against Brechin. McDonald came close to doubling his tally a couple of minutes later. A cross from the right was headed towards goal by the Australian striker, although Smith did well to block his effort from point-blank range. The second goal was not long in coming, and after only six minutes of play it was 2-0 to the home side. A short corner from James Keatings on the left was met first time by Sam Stanton at the corner of the penalty area, and although his shot was not the most powerful it squirmed past Smith at his right hand post and into the net. 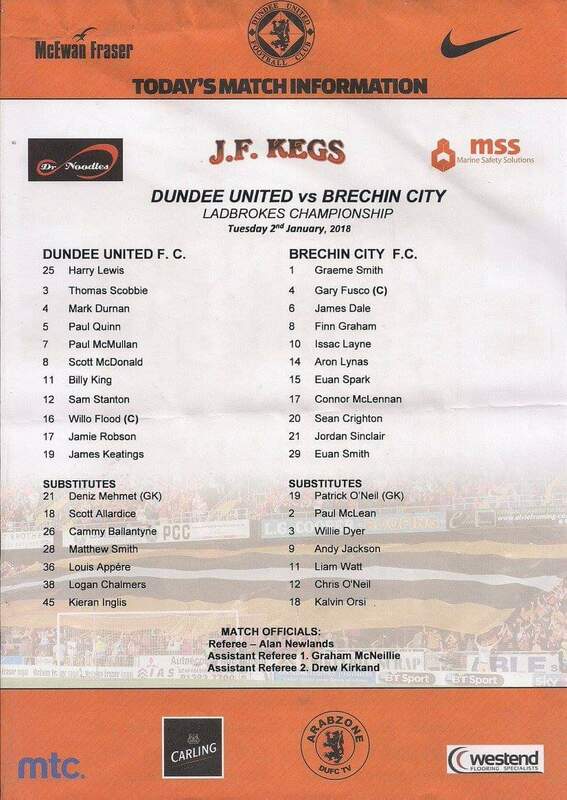 The stunned Brechin City side did try and hit back after those setbacks, and former United player Euan Spark was the first to threaten with a purposeful run down the left-hand side on 11 minutes, which was only ended by a crude challenge from Paul McMullan which saw the winger pick up a yellow card. That booking was to prove costly later on. United did continue to create the bulk of the chances. After 16 minutes, McMullan set up Stanton who had a go from 25 yards out, but on this occasion his shot lacked direction and went well wide. Ten minutes after that, Connor McLennan was forced into a goal line clearance from Mark Durnan’s header and on the half hour mark Sean Crighton was forced into a superb block to prevent Sam Stanton from notching United’s third goal of the game. Even at this relatively early stage, there was a sense that the away side were already concerned about nothing more than damage limitation, although they were helped in this approach by the United players rather taking their collective foot off the pedal as half time approached. A minute before half time, Brechin did create their best opportunity of the first half with Connor McLennan unleashing a shot from the edge of the box that whistled just past the post. 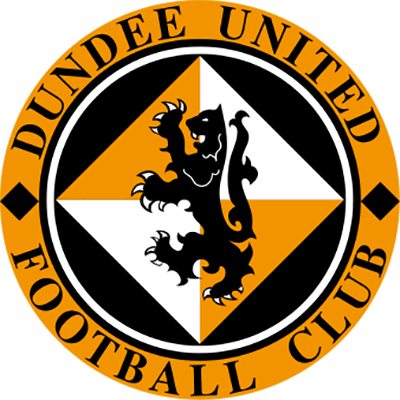 United’s injury woes continued on the strike of half time when Durnan was forced out of the game after a 50/50 challenge with Isaac Layne. He was replaced during the half time interval by Cammy Ballantyne, who went to right back with Tam Scobbie moving over into the more familiar role of centre half. Brechin began the second half with another shot by McLennan which Harry Lewis did well to save, before United had an effort of their own when James Keatings was played in by Scott McDonald, but Graeme Smith was able to smother the ball. As in the first half, it did not take United long to get on the scoresheet, and after 49 minutes they made it 3-0. Sam Stanton picked up a loose ball in midfield and passed the ball out to the right hand side, where Ballantyne crossed the ball to Scott McDonald around ten yards from goal. He drove the ball past Graeme Smith for his second and United’s third. It was 4-0 two minutes later, as for the third straight game United won a penalty, this time through McDonald bursting into the box and being taken out by an onrushing Graeme Smith. Perhaps surprisingly given he was on a hat trick, McDonald did not take the penalty himself. Instead, it was James Keatings who took the spot kick, and he slammed the ball past Smith to give United a four goal lead and break United’s recent penalty jinx. United continued to dominate, and after 56 minutes Billy King has a shot which went just wide with Smith well beaten. However, there was to be a twist two minutes later when United were reduced to ten men. Paul McMullan, who had been booked earlier, dived at the edge of the penalty area under pressure from Gary Fusco. If there was any contact, it was minimal. McMullan’s second yellow card was fully deserved and meant United had to see out the last half hour of the game with ten men. The dismissal gave the Brechin players some encouragement, and they began to take the game to Dundee United. Five minutes after McMullan’s dismissal, they had their best chance of the game from a Euan Spark header which was tipped over the bar by Harry Lewis. From the resultant corner, Tam Scobbie was adjudged to have fouled Sean Crighton in the area and the away side had a penalty of their own. Jordan Sinclair took the kick and smashed the ball into the net giving Lewis no chance. Sinclair nearly doubled his and his team’s tally five minutes later with a stunning 30-yard half volley which only just went over the bar. At the other end, a cross from substitute Matty Smith found Billy King at the back post but he could only hit the side netting with the goal at his mercy. United were able to see the game out despite their numerical disadvantage, and could have added to their lead on a couple of occasions. In stoppage time, Billy King was played through by Smith. His initial shot was saved, and he had a second attempt on goal when the ball rebounded to him, but again Smith was able to save. Although Csaba Laszlo did express unhappiness after the game at what he perceived was complacency among the United players after both the second and the fourth goals, and his fury at McMullan getting himself sent off for diving, it was a good result after the massive setback in the previous game. As St Mirren could only draw with local rivals Morton, the win took United back to within three points of the Paisley team, still with a game in hand.